We were talking about domestic emergencies for last week's Finance Fridays. For this week we're going international and looking at the fluctuating currency markets. The continued uncertainty over Brexit and the announcement of Article 50 being triggered before next March has left the pound at its lowest ever rate. What does this mean for us though? Basically it means things we buy from abroad will be dearer but goods and services we sell overseas will be cheaper for the buyer. 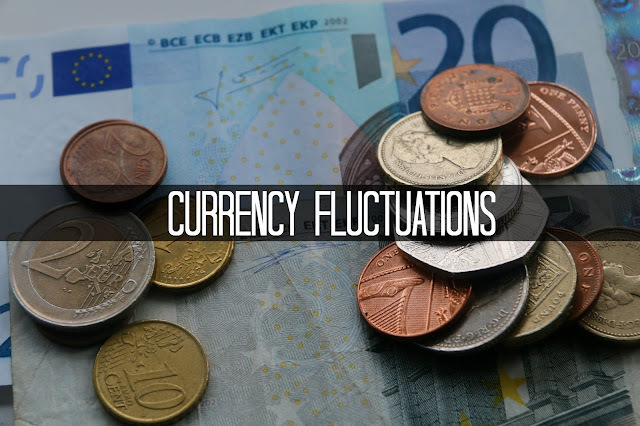 This means we are all affected by these currency fluctuations so here are some of the things to look out for. Buy British – It's so easy to walk into a supermarket and buy whatever fruit and vegetables you want all year round. The trade off for this is higher prices at times when the produce needs to be sourced from abroad. So stick to British seasonal fruit and vegetables. If you want to keep stocks of your favourite find out what can be frozen for using when the prices go higher. Sell abroad – A couple of weeks ago I was paid for some work I did in US Dollars. At the time I was rather pleased that not only did they pay promptly but that the pound was falling which meant I received more when it was converted to pounds. If you have your own business or you work for a company where you have some influence on sales it's time to rethink your strategy. A falling pound means British products are now cheaper abroad which makes them far more attractive. It's time to investigate new markets and new opportunities. Staycation – With going abroad costing more a holiday in Blighty might be the best solution. If you book accommodation in Europe directly the price quoted is often in Euros therefore making it more expensive as the pound falls. Also if the pound keeps at its low level when you get to your destination everything else will be much more expensive. Buy currency for using in the future – If you are going to need US Dollars or Euros in the coming months it may be best to start stocking up now. Many financial forecasters are expecting the pound to drop further in the coming months. I wouldn't advocate storing cash at home but you can fix your rate by loading cash onto a prepaid currency card. These can be used abroad like a debit card and come with a Chip and Pin facility. Be fuel efficient – With oil barrels traded in Dollars we have already seen a rise in petrol and diesel prices in the last few weeks. Where you can cut down on unnecessary car journeys particularly short ones where you could walk instead. Have you noticed any changes in prices? Have you thought about amending any future plans? If you want to join in with this week's Finance Fridays then add your link to the linky below. Any post concerning financial matters is allowed. Full details here. It doesn't have to be published today as you have until 23.55 on Tuesday 18th October 2016 to join in. Ooh your point about selling abroad resonated with me - I too often work for clients who pay in USD. Thanks for sharing. This is so handy thank you, as a traveller and a self employed person! Really interesting. I like the idea of selling abroad. Makes a lot of sense also to plan ahead in terms of currency buying. It's a tough time at the moment, and I fear it'll only get tougher! I get paid in dollars for the ads on my blog and I've started to notice the difference - it is a bit worrying though!